This web page took two to three hours scan, research, design, and upload. Thank you for supporting the Virtual Steam Car Museum! As did many firms at the turn of the 19th century, Peter Forg entered the automobile business as a supplier of parts. 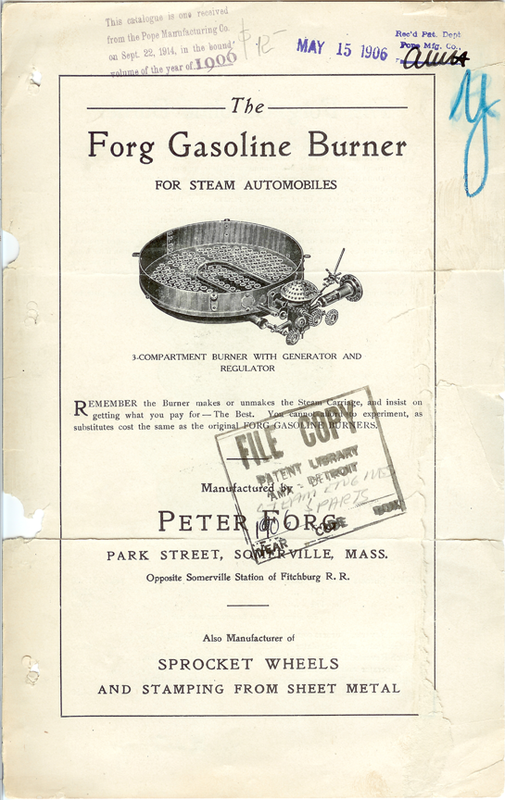 Forg never manufactured a car, but it provided aftermarket boilers, burners, and specialty items. The firm is still in business today. 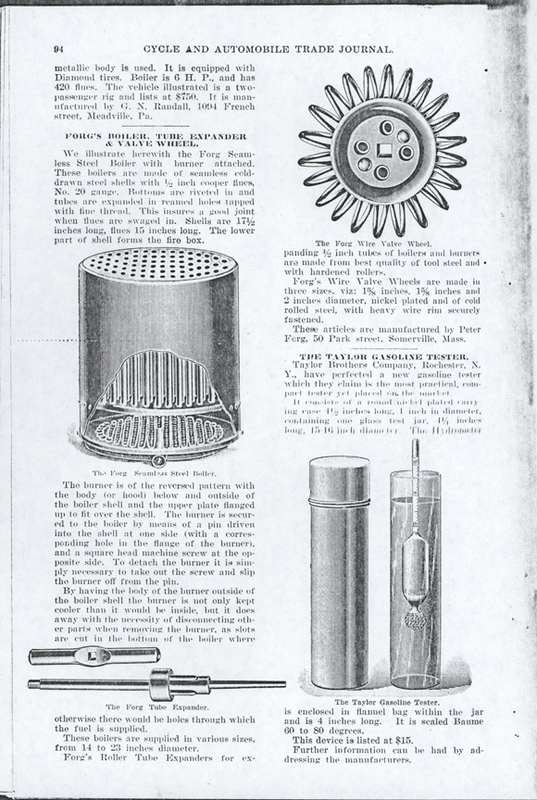 This article appeared in the March 1902 edition of Cycle and Automobile Trade Journal on page 94. 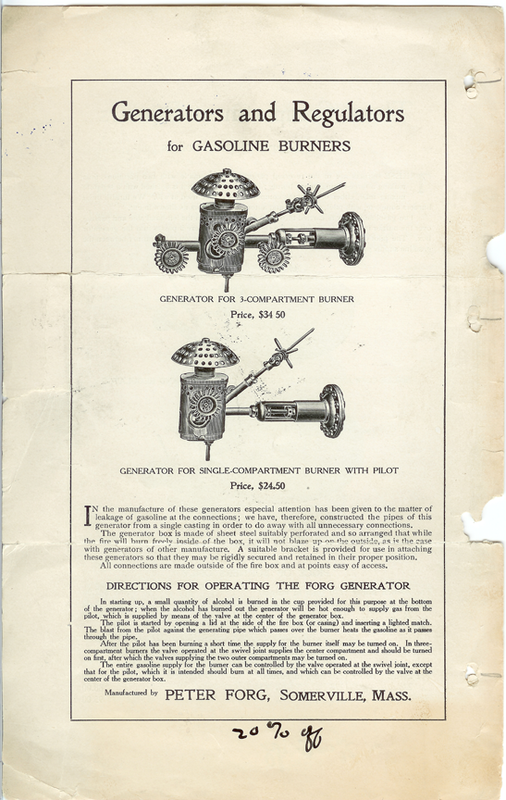 It described Forg's boiler, tube expander (to swedge scorched boilers), and its valve wheel handle. John A. Conde Collection. 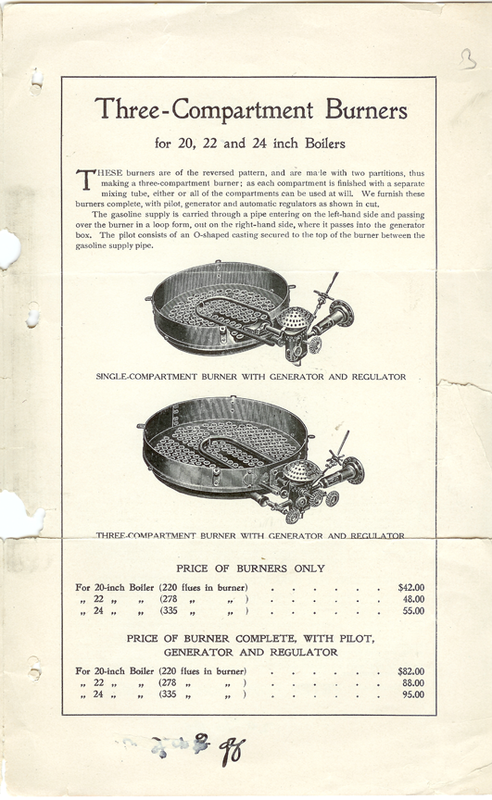 This advertisement for the Forg Gasoline Burner appeared in the Cycle and Automobile Trade Journal in 1904 (month unknown) page 4. Interestingly, the advertisement lacked a corporate name and address. The Peter Forg Manufacturing Company's advertisement appeared in the February 1905 issue of Cycle and Automobile Trade Journal, p. 236. John A. Conde Collection. 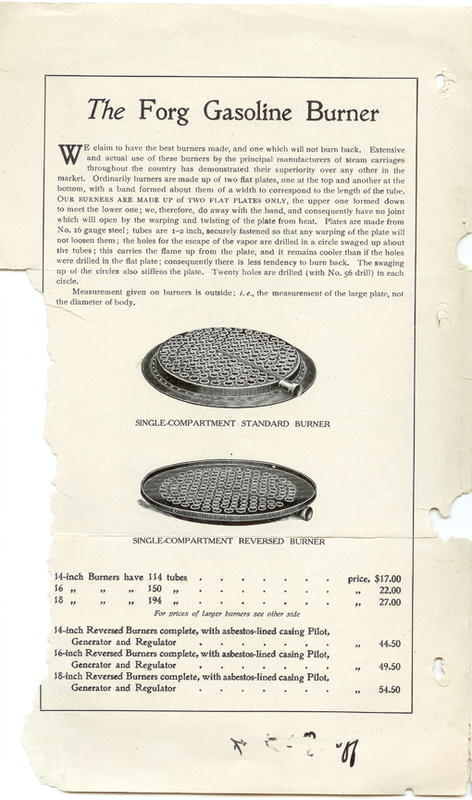 The Peter Forg Company produced this catalogue in 1906. It carries three file stamps. One from the Pope Manufacturing Company's patent department, dated May 15, 1906. One from the Patent Library AMA - Detroit. One from the Stevens Institute of Technology that received the Pope Manufacturing Company's files on September 22, 1914. 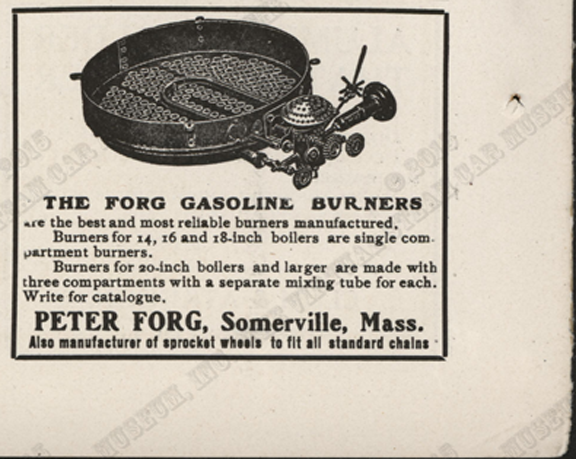 The Peter Forg Manufacturing Company's advertisement appeared in the November 1907 issue of Cycle and Automobile Trade Journal, p. 392. John A. Conde Collection. For over 125 years, the Peter Forg Manufacturing Co. has been producing metal stampings on a job shop basis, for both long and short run needs. Now in its fifth generation of management by the Forg family, the firm is a mature corporation with a stable work force and a record of steady growth. Our large inventory of equipment and presses of up to 500 ton capacity make even the heaviest stampings possible. Our existing stock of round dies can eliminate tooling costs. Whatever the fabricating requirements, routine or otherwise, Peter Forg Manufacturing is competent to surpass your needs. Contact us if you have additional information about the Peter Forg Manufacturing Company, or if you have questions.